Ever hired an employee that didn’t live up to expectations? Or didn’t mesh with your company culture? When you’re growing your agency you don’t have the time or resources to waste on boarding and training employees who aren’t a good fit. But hiring is HARD and you’re BUSY, so how do you expedite the process and get quality talent? You follow the 7 step hiring process I created. I know 7 steps doesn’t exactly scream quick, but the amount of time you’ll save by hiring right the first time makes it worth it (plus, it’s easier than you think). 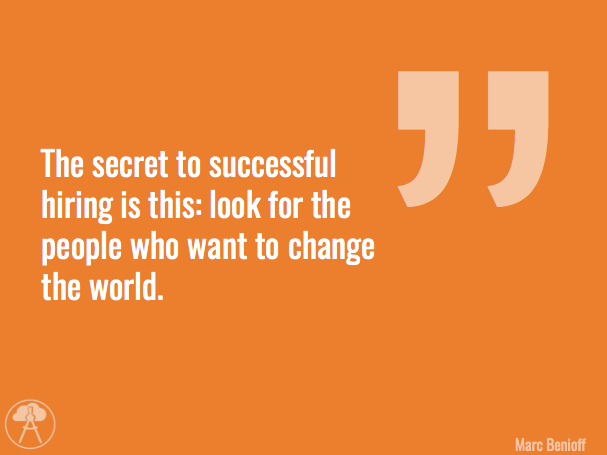 One of the most important parts in the process is the face-to-face interview. You’re finally meeting the candidate who may be the piece of the puzzle that your agency is missing. The only way to really find out is to ask the right questions. Questions that don’t proceed pre-canned and rehearsed responses. Questions that get right to the core of the candidate and give you the insight you need to make the right decision. Questions like these…. 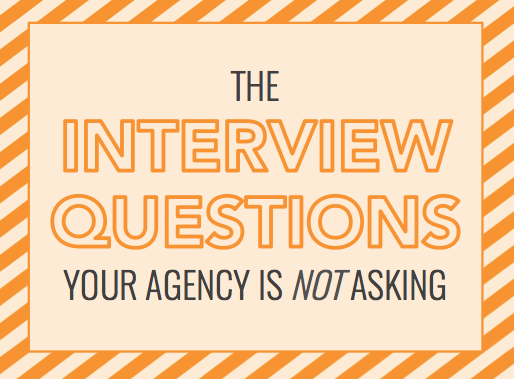 Asking questions about your agency is a great way to measure how prepared and how dedicated a candidate is. If a candidate looks great on paper and has all of the necessary hard skills, but can’t answer agency specific questions, then they aren’t a good fit. They either don’t care enough about the position to do a quick Google search or preparation just isn’t in their nature. Whatever the reason, they’re unlikely to be a good fit. If a candidate looks great on paper and has all of the necessary hard skills, but can’t answer agency specific questions, then they aren’t a good fit. Which one of our core values do you identify the most with? What do you expect to find at this agency that you didn’t get from your previous/current employer? Based on what you know about this job, how would you describe it to a 5 year-old? Some interviewers are against hypothetical questions, stating that knowing what to do and actually doing it don’t always go hand in hand. And while there is some truth to that, hypotheticals aren’t completely worth discounting. They can offer valuable insight and put candidates to the test. Ideally, candidates would be able to tell a story about a previous experience and then they would elaborate on what went right/wrong, and how to handle it a second time around. But one of the benefits about using hypothetical questions is that you can ask them if you’re hiring for an entry-level position. This is great because you can get insight from candidates even though they have very little relevant experience to pull from. You have a big deadline coming up at work and a new high-priority item gets handed to you. How do you proceed? Let’s say you’re giving a presentation and during that presentation a member of the audience keeps stopping you and diverting you. What would you do? You’re in charge of a team and one of the members is performing poorly and missing deadlines, how would you handle this situation? So let’s say you get hired and your first assignment is to plan the company christmas party. You’ve got a budget of $5000, what would you do? The interview process is can be so formal, uptight, and nerve wracking. Is that really what your agency is all about? Try tossing in an out of the box question to lighten the mood, leave an impression on the candidate, and get valuable insight. These questions aren’t really about the candidate giving a right or wrong answer, but about the thought process behind it. You can see how a copywriter articulates themselves, how a data analyst solves problems, and how well anybody will fit into your company culture. Pay attention to their body language and their immediate reaction. The most important thing is that the candidate has fun with these questions and isn’t intimidated by them. Describe the color yellow to someone who can’t see it. How many square feet of pizza is consumed in the US each year? (NOTE: Don't miss out on getting all of the details on our 7 Step Hiring Process).